Tell us a little about Zurich’s drinking culture. Switzerland is a wine and beer country when it comes to alcoholic traditions. These are the most consumed drinks after a hard day’s work. In most bars and pubs the demand for an unexciting long drink follows as it gets later in the evening. The aperitif and after-work drink tradition is very strong in Zurich. Due to the fact that most of the residents have nice apartments or homes the need to spend the evening at home is bigger than to spend the night out drinking. I think the wine and beer tradition will stand with the locals but due to many expats currently flocking into Zurich, the demand for cocktails is rising at a steady pace. When did the Swiss get into cocktails and how developed is the culture? The drinking culture has come a long way. Zurich used to be a hotspot for cocktail drinkers in the 1960s. Because of its international banking and art network Zurich quickly adapted itself to the needs of the visitors. The Kronenhalle Bar opened its doors more than 50 years ago and is still one of the cocktail hotspots to this day. Unfortunately Zurich lost a lot of its drinking culture in the ’80s and ’90s when a long drink or highball era hit the city. Clubs and music bars popped up in all corners. No professional bartenders and definitely no chitchat was needed for this so the craft was nearly lost. In the past few years, though, Zurich has lived through a versatile cocktail boom. The interest in drinking cocktails instead of beer and wine, which is today still the most consumed alcoholic beverage, has risen at a very fast rate. Cocktail bars are opening all over town – some of them with bartenders from France, Germany, Japan, or even Swiss bartenders who have come back from London to implement the things they’ve learned abroad. Are there any stand out Swiss drinks – who made them and at what bars? Probably the most famous drink in Zurich is the Lady Killer by Peter Roth of the Kronenhalle Bar. He just retired from his bar manager position after running the Kronenhalle Bar for more than 36 years. With this cocktail he won the 1984 IBA World Championship in Hamburg, Germany, and it is still today a cocktail found on many bar menus in Switzerland. One other drink that is asked for in many bars is the Hellboy, by Markus Blattner of the Old Crow bar. A delicious drink with Laphroaig, honey, chilli and Frangelico. 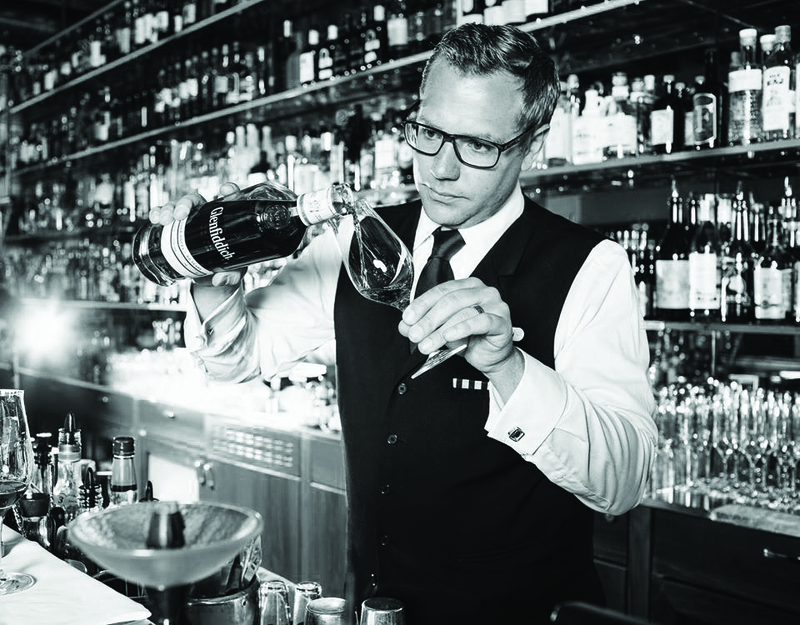 What are your favourite bars and bartenders in Zurich - who’s pushing the industry forward? I guess my favourite is still the Kronenhalle Bar. A place with a history, where Martinis are stirred to perfection. The newly appointed bar manger, Christian Heiss, is a master of his craft, I guess he learned from the best (Peter Roth). Other bars I love to visit include the Balto Bar with bar manager Luis Alberto Estrada, still a newcomer to the Zurich bar scene but already doing great things. Tales Bar with Wolfgang Bogner and his team, Rooftop Bar with Jennifer Ann Hunziker and Markus Blattner and his team at the Old Crow are definitely ones to visit when enjoying Zurich’s bar scene. A new, interesting concept opening up in the next few months is the Cinchona Bar – a day-drinking bar specialising in aperitifs. What are the challenges facing local bartenders? I think the biggest challenge is to satisfy. Here in Zurich, bartenders watch every other bartender very closely to see what they do and what they could do better. But then they are also very quick to judge. There is a lot of competition going on at the moment so the tension is high. The investments and wages are very elevated compared to other countries, so results are essential.